I worked really hard on my sixth grade narrative writing rubric. REALLY HARD, as in hours on end one weekend. The thing about rubrics is they take forever to write, but once you’re done, they save you so much time when grading! Between the complete switch over to Common Core (last year was a half-switch) and teaching a new grade, I’m having another first year! It’s okay though…after 9 years of teaching the same subject and grade, my curriculum needed an overhaul. Of course I had been making changes every year, but starting fresh is awesome. I went a little nerdy with my rubric and made it so it automatically adds the scores for you. I teach English, remember. Adding numbers is not my favorite. I started by figuring out which Common Core Standards I wanted to use. Then, I rewrote them in student-friendly language to make them fit my assignment. Of course, being nerdy like I am, I had to color-code the standards to match the categories I placed them in (see the next step). Next I sorted the standards into 5 categories: narrative structure, creativity, technology, language, and format. My scoring was “completely met the standards” for a score of 3, “partially met the standards” for a score of 2, “close to meeting the standards” for score of 1, and “did not meet standards” for a score of 0. I had to write the criteria for each score in each area. The super cool part of this rubric is when you choose an area, it lights up in blue and automatically puts the score to the right! This is done by adding a period to the last sentence in the scoring cell. I learned about this strategy on Katrina Kennett’s blog. She has a lot of great ideas for using Google docs! The total points are at the end, along with their percentage. I also have mine to set up to include the letter grade using our school’s grading scale. If it isn’t graded yet, it says “not yet graded”. This is so when the students are given a rubric beforehand they don’t panic at the zero. I use this rubric in Google docs. I use gClass folders to create a shared folder between each individual student and me, and then I use Doctopus to place a copy of the rubric in each student’s folder. This allows them to view the rubric before they do the essay (a very important part of writing). Maybe later I will do a post on how I use gClassFolders and Doctopus, but for now, enjoy the rubric! I am going to place it in my Teachers Pay Teachers store. This entry was posted in Google is Taking Over the World, Teaching Ideas, Tech Nerd by Jan. Bookmark the permalink. 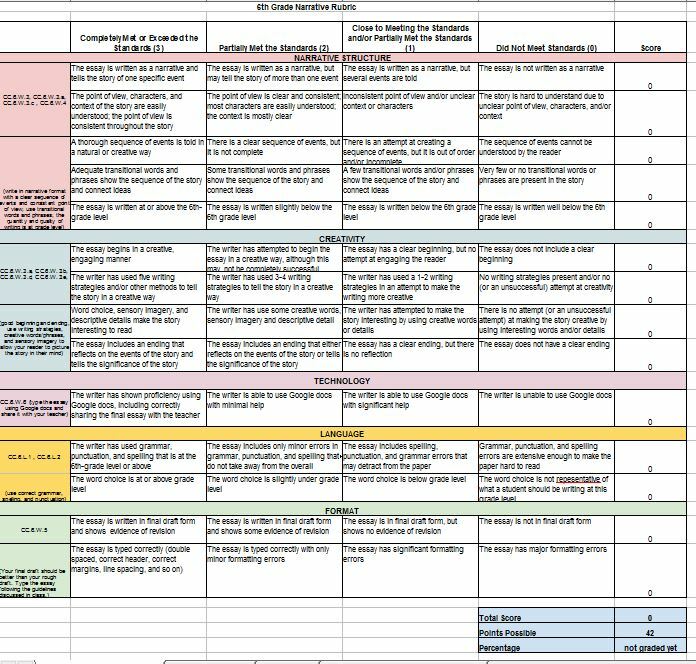 I love the first chart where you have the common core standards and what that means to the current assignment – parents as well as students will really appreciate that since Common Core is so new!! I hope so! The writing CCSS aren’t drastically differently, luckily. A lot of this is Greek to me, but it’s obvious that you are passionate about creating an objective grading system, which I’m sure your students appreciate and I bet it really does make your job easier. I know anytime I come up with a technology solution to make my job easier, I’m extremely proud of myself because tech stuff is so outside my wheelhouse. So — awesome job! Awesome – thanks for sharing all your hard work! I teach 7th and 8th grade English and can use this rubric as starting point, too. Glad to share! 🙂 I’m sure you can modify pretty easily for 7th-8th grade.